Paradise WordPress Theme uses a great deal of white space, combined with a light background to create an ultra-clean feel to this site. The elements of this Paradise design are nicely spaced out, combined with a limited color-palette to create a clean overall design. The white background and elegant typography combines to make a very fresh design. Paradise’s homepage provides visitors with the minimum amount of information they need, presented in a neat and unfussy way. Clicking on the tabs reveals the details. 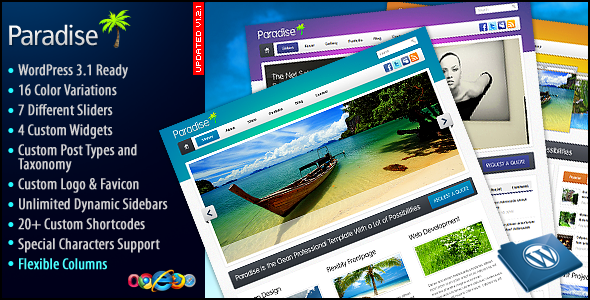 Paradise gives you a flexible frontpage layout. Besides the slick animated slide shows. You change layouts from Left Sidebar to Right, do the full width page. Also you can manage the footer sidebar or turn it off if needed.